We have been given an opportunity for one lucky My Mummys World reader to win a selection of three Little Tiger Press books. The stories are Fred and the Little Egg, Babbity's Big Bad Mood, Rosie's Special Surprise, A Duck So Small and Dora's Chicks. 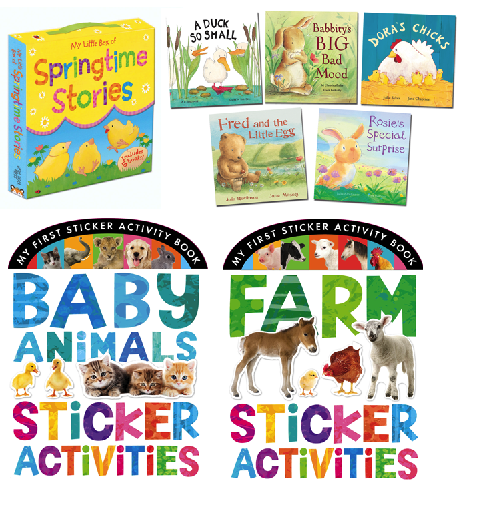 Toddlers will learn all about baby animals and farm animals in these adorable sticker activity books from the Little Tiger Kids imprint. Each with 80 pages of activities, over 200 photographic stickers, doodles and learning activities, these bumper activity books will keep toddlers busy for hours – they are full of learning fun! Competition Time. Its simple to enter our giveaway for such a lovely prize. The giveaway is open to all UK residents. A winner will be chosen at random via the Rafflecopter app and announced upon this page. The winner will be contacted via e-mail within 3 days of the competition ending. If there is no responce within 7 days another winner will be chosen. Entries are checked before the winner is announced. I love decorating boiled eggs with my children then I hide them around the garden! We love an easter egg hunt followed by a lovely family roast! Great for all the family and good to catch up with everyone. We love a big egg hunt with my two and their cousins, followed by eating lots of chocolate of course! we visit the zoo every easter. i love going! easter egg hunt - the kids love it and its great fun! We love the Easter egg hunt at my sister's house, if the weather is good it's out in the garden. Apart from eating chocolate (!) I love arranging an easter egg hunt for my son. Spend time with my family and watch the Passion! Watching my children hunt for their eggs. Easter Egg hunt in the garden, it's so funny watching Monkey's face when he discovers the treasure - priceless. Go feed the lambs at a local barn because it's fun and they are cute. Spend time with the family and eat lots of chocolate because it is fun! Eating Chocolate eggs and chocoate bunnies! we have an easter egg hunt with my grandson daniel 4, he does this with his uncles who are 27,25 and 22. i think they enjoy it as much as he does!! An Easter Egg hunt with the family as I love chocolate!